For some uncanny reason, March has had a lasting impact in history, be it the turning point for the Roman empire (the Ides of March) or a watershed moment for markets (March 9, 2009). Yet again, a gush of epochal announcements continuing to spew out this month, could be pivotal for international relations (e.g. US-North Korea proposed meeting, TPP-11, China-power consolidation, US Secretary of State replacement, etc.) and global trade. As for the latter, whether it is the “art of the deal” or the deal itself, the slap of US tariffs on steel and aluminum imports is likely to sting America first, in its grandiose plans to rebuild its aging infrastructure. The pain inflicted could be as much (if not more) as for downstream industries, autos to beer cans. As if the mystery of bridging the shortfall in total US infrastructure spending (pegged at $200 billion vs. estimated capex. of $1 trillion over the next decade) was not enough, the tariffs make it more expensive to build roads, bridges, schools, health centers, energy pipelines, etc. Public spending in infrastructure in the developed world, particularly EU, is already on a downtrend since 2008 mainly due to a decrease in capex by subnational governments (regional and local), that are responsible for on average 60% of public investment in the OECD (OECD Regional Development Working Papers 2017/05-Subnational Infrastructure Investment in OECD Countries: Trends and Key Governance Levers). One would therefore expect the declining role of governments to pave the way for private sector to play a crucial role in bridging the gap. Contrary to expectations, 2017 Preqin data shows a year on year decline in global aggregate infrastructure investments by ~6% in deal volume and ~30% in deal value due to delays in privatization, valuation, etc. Like other private assets, dry powder touched $160 billion, now over a third of $420 billion plus industry AUM. Underlying this, is investors’ continued reach for yield which lured over 500 unlisted infrastructure funds (mainly North America and Europe) to raise $300 billion plus in assets, in the last seven years. The result- too much money chasing too few opportunities, inflated assets (and compressed yields), and capital concentrated into a limited number of funds. Consequently, the median annual return of 17% for infrastructure funds that began investing between 2000 and 2005 averaged about 10% post the financial crisis. Despite these odds, an enduring low-return environment marked with rising volatility continues to attract investors (Preqin’s Dec 2017 investor survey shows 39% have near term plans and 55% over the longer term) to a handful out of 166 unlisted infrastructure (mainly DM equity) funds in the market collectively seeking over $120bn in capital (Jan 2018). The Investor Perceptions of Infrastructure, 2017 a survey conducted by EDHEC Infrastructure Institute, presents similar LP (and GP) propensities and attributes this to their greater familiarity with OECD markets. This is quite ironical because 85% of the surveyed respondents expect the future infrastructure pipeline to grow in EM (vs. 35% for DM) offering substantial upside. To add, managers peg OECD private infrastructure equity returns at 11-12% annualized with a potential to capture an emerging market risk premium of 6-7%. This familiarity for DM markets is probably breeding contempt for new vistas of growth in EM that can potentially impact both portfolios and the socio-economic quality of the developing world. Many emerging countries like Indonesia, India, China, Mexico, and Brazil as well as parts of Africa and the Middle East have structural drivers for infrastructure growth to meet the needs of their growing populations, economies, and cities to keep pace with urbanization trends. One example is China’s “One Belt One Road” initiative which would potentially enhance transportation infrastructure encompassing 65 countries. India plans to increase its highway network roughly four times the distance from New York to San Francisco while Mexico plans to upgrade its airport system. Other such national agendas include Saudi Arabia’s Transformation Program 2020 and Chile’s Agenda De Concesiones (2014-20). Beyond higher return potential and structural drivers, infrastructure in EM has a broader definition with wide-ranging socio-economic benefits. EM investments in electricity production, energy renewables, health, water, security, transport, banking, and school systems, improve macroeconomic sustainability, reduce poverty by promoting productivity, address resource depletion, and provide access to public services. For example, greater urbanization and a growing middle class is also likely to increase demand for financial services. Despite the great push by the Modi government to bring India’s vast underbanked population within the banking network and use digital wallets like Paytm, only 51 percent of adults in the country actively use banks and 80% of all transactions are still conducted in cash (InterMedia). 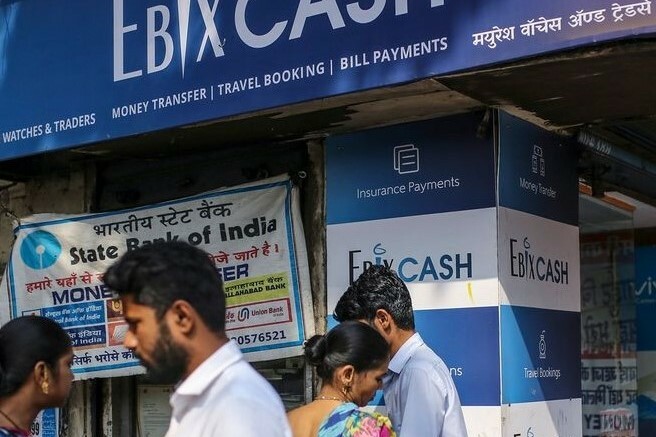 Investing in quasi bank outlets like EbixCash (pictured), provides banking services to the financially illiterate enabling them to make small savings deposits, pay bills, transfer money, or collect cash sent by relatives working abroad. Also, local markets are not deep enough to fund medium to long term growth of very small enterprises purely from domestic sources thus creating a role for cross-border micro-financing. In the last decade, foreign flows into microfinance has grown over six times to ~ $13 billion. In parts of Africa, India, etc. fixed infrastructure (ATMs, physical branches) has leapfrogged to embrace mobile technology offering a range of financial services to those typically excluded from the financial sector. Usage of mobile banking is likely to continue as mobile broadband usage and coverage accelerates in the developing world. Since cash still dominates all rural money transactions, digitizing payments within the agricultural sector integrates agriculture, finance, and telecom infrastructure, to create new rural service delivery models to benefit entire value chains-producers, buyers, SMEs engaged in transportation, storage, processing, and packaging. This catalyzes economic growth and contributes to tax revenues, increasing the government’s ability to provide key services. Equally notable are China’s new green policies to become a leader in technological innovation across electric vehicles, solar panels, renewable energy, etc. by raising spending ~20% to over $6 billion to curb pollution “airpocalypse”. Infrastructure investing like all investments, comes with its own set of risks. For starters, the strategy in and of itself is opaque and not very liquid. The role of the state in public private partnerships exposes the sector to bureaucracy, and contingencies arising from government action. Gestation periods of projects are long, and fixed costs often high thus raising break-even levels and exposing projects to risks from regulatory bodies, potentially taking the form of an unfavorable tariff review or retroactive charge. In some instances, loan-pricing conditions and covenants carry the risk of making commercial projects unviable. Lack of operational firm-level data (e.g. traffic demand data, accidents, failures, operating cost, etc.) can be a limiting factor for new investments. Situating projects in EM brings additional risks. For instance, according to a recent Indian govt. report, as many as 359 infrastructure projects have shown cost overrun of $30billion from delays in land acquisition, forest clearance, supply of equipment, funding constraints, legal cases and slack law and order. Systemic corrupt behavior including nepotism in business contract allocation, unfair distribution of regional transfers from the central government and, distorting data can jeopardize investments. As recently reported, a rich business family (Guptas) exploited its friendship with the former Zuma administration in South Africa to win state business contracts and manipulate political appointments. Natural disasters can have devastating effects especially in EM that tend to have looser regulation and scarcer resources to respond. Experienced investors try to address some of these risks by ensuring a country’s GDP is resilient and demand inelastic, affording pricing certainty. They also emphasize long-term committed revenue contracts from investment grade counterparties, and ensure all operating permits are in place. EM companies, perceived laggards in sustainable practices (such as corporate disclosure, pollution, workers’ safety etc. ), can benefit from robust ESG practices instituted by astute investors to enhance the quality, stability, and predictability of operations to enhance both social and financial returns. Compared to public infrastructure equities, private infrastructure funds have outperformed as these operate in less efficient markets and segments thus commanding higher investor interest. Unlisted infrastructure is not subject to the same real-time mark-to-market volatility and would likely withstand better a rising interest rate environment (though some listed funds may have monopolistic assets and inelastic demand) with an arsenal of tools to manage interest rate risks. Thus, a handful of household DM focused private infrastructure investments continue to lure the vast majority of under-allocated investors with a promise for growth and yield in a low-return, unpredictable environment. However, LPs should be mindful if their favorite few GPs are only baby-sitting their cash or piling into more energy (including renewable) projects at expensive valuations, or worse still expanding “infrastructure” to include, for example, coin operated washing machines. LPs should also strongly consider broadening their horizons (and comfort zones) by spreading their infrastructure investments to EM and potentially earn 6-7% return premiums while making a lasting impact on EM economies. For a positive lasting experience, investors should carefully diligence local infrastructure managers to understand their strategies, execution, and historical returns (time weighted, risk weighted) including loss history. ÊMA continues to remain responsive to investors’ ongoing search for return premiums and is conducting independent investment audit on regional EM alternative specialists who can create a lasting impact on both EM economies and LPs’ portfolios. Stay tuned.